The Yom Tov season was full of davening and meals. Lots and lots of meals. Platters of food. Pitchers of juice. A medley of young and old voices; punctuated by occasional yelps and exclamations. Spilled drinks. While those meals present their own challenges of seemingly never ending shopping, cooking, serving and cleaning, there is no denying the fun, chaos, and bonding that occurs when families spend time together over the Yom Tov season — eating, talking, singing, and connecting. Now that the season is over and we all resume our busy routines, it can be challenging to hold on to the experience of family togetherness by maintaining a ritual of family meals as often as possible. However, it is a practice well worth maintaining. While frum families have the built-in benefit of Shabbos meals which are generally spent with family, many families in today’s fast-paced world, frum or not, do struggle with making family meals a priority during the week as they try to balance multiple schedules, carpools, and community responsibilities. The hectic pace of life has created a climate that makes it more challenging to eat family meals together. However, as research increasingly shows, it is well worth the effort to make family meals a priority, as the ensuing benefits are numerous. To explain the significance of family meals, I turned to Mrs. Miriam Weinstein, a social worker who published a book detailing her insights and research about the positive effects of mealtimes shared with families. When I asked what made her develop interest in this topic she responded, “I got involved with this because it’s such a simple idea with such wide ramifications. 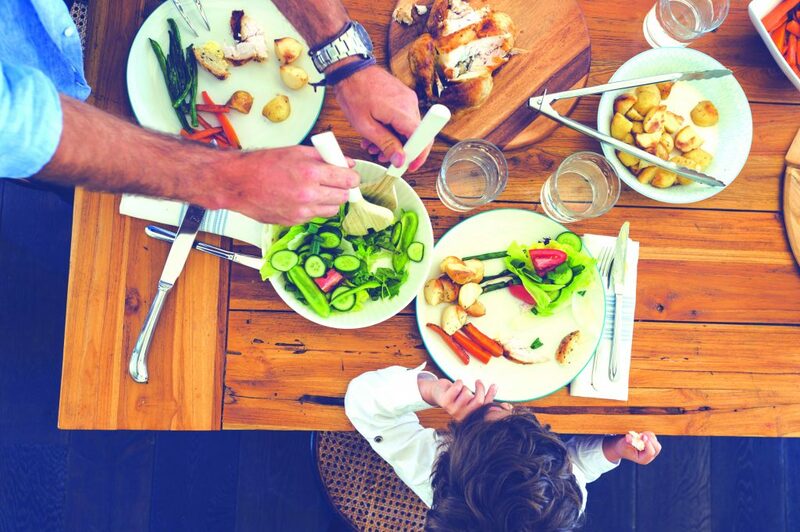 It’s common sense, most people can do it or can do some version of it, and it’s helpful in so many ways.” The primary advantage of family meals is that it helps families stay connected day by day. It is an expected, predictable time when children know they will connect with and check-in with their families, whether they had a good or bad day. The set-up of sitting around a table causes the family members to have to face each other and make eye contact. There is research to support the idea that children who eat more meals with their families, particularly supper, are less likely to be involved in self-destructive or anti-social activities and behavioral problems, irrespective of social class. In 1996, the national Center on Addiction and Substance Abuse at Columbia University [CASA] ran a study intending to see what differentiated kids involved in substance abuse from those who were not. CASA has repeated the survey every year since, and every year, eating supper together regularly as a family tops the list of variables that are within our control. Kids who eat more family dinners do better than those who eat a few. Kids who share a few dinners weekly do better than the ones who have none at all. At the Table – Now What? Family dinners are one way to revive “the art of dinner conversation,” and for this, parents can certainly set the tone. “If your children or teens don’t talk much about their days, then you should talk to them about yours,” she advises. “Be on the lookout for interesting stories, tidbits and conversation topics that could draw them in. It should be comfortable and interesting so that the children want to be there.” Other ideas for conversation include having each family member share a good or bad part of his/her day, telling jokes, or using conversation starters. One napkin company prints a family pack where each separate napkin is a lead-in for friendly dinner conversation! Age-appropriate table expectations also help, says Mrs. Weinstein. For example, a three-year-old may only sit for 15 minutes, and that’s fine. Another resource that was created to help families turn regular family meal time into a doable reality is “The Family Dinner Project,” a non-profit organization currently based out of Harvard University. Among their resources are budget-friendly recipes, one-pot dinners, a “stocking-up list” for ingredients to keep in the house so there’s always something to serve, tips for addressing family scheduling dilemmas, ideas on how to have fun with dinner preparation, and conversation starters divided by age group, designed to get kids thinking and participating in a discussion. For example, for 2- to 7-year-olds there is a conversation starter about an 8-year-old boy who won $1,000 in a scavenger hunt and gave it to the family of his 2-year-old neighbor to help pay for the young girl’s cancer treatment. This is followed by “food for thought” questions like, “What would you have done if you were that boy?” and “What do you think happened to that boy when he became older?” The Family Dinner Project also offers ideas for engaging children in family activities after dinner, like decorating placemats. Dr. Linda Pagani, a researcher and therapist in Montreal, has been involved in a longitudinal study of close to 1,500 children, looking at the associations between the quality of a child’s family meal environment at age 6 and that same child’s overall health and well-being at age 10. The study controlled for many factors that may contribute to a child’s well-being or lack thereof, including gender, temperament, cognitive ability, baseline BMI, and whether the parents were happily married. Findings show that even after accounting for the difference in a child’s well-being related to all those factors, there was still a statistically significant difference in the well-being of children that could be accounted for by having quality family mealtime. That difference in well-being included better general fitness, better BMI ratio, less soft-drink consumption, less oppositional behavior, and less delinquency and aggression. Dr. Pagani explains that even though parents and children live in the same place, they aren’t always interacting. Eating, however, is a social activity, and thus it serves as an occasion to socialize children to the world and enrich them. A child sitting at the dinner table with parents can learn manners and ways of engaging in proper conversation. A child also picks up on many implicit themes. For example, if a parent tells stories from his day in a positive and optimistic way, the child will absorb that attitude, and the opposite is true for negativity. When it comes to finding the correct balance of how to teach children proper manners without making it a stressful or critical experience, Dr. Pagani recommends choosing one rule at a time for the family to focus on, such as, “we don’t get up from the table during the meal,” or, “we don’t interrupt,” and make that the one goal for the week, rather than bombard children with many rules at once. In a world where family life is becoming increasingly complex as we juggle multiple priorities and distractions, perhaps it can take something as basic as regular family meals to ground us and bring us back to connecting with our families regularly, showing them how important they are, and teaching our children valuable life skills while sharing wholesome meals together.